Fleet Command is responsible for the force generation of naval elements for subsequent employment on operations by the Chief of Joint Operations (CJOPS). This responsibility includes group training (ie. task group level) and the naval aspects of joint collective training (Defence elements from Services working as a Joint Task Group or force) together with the mounting process to provide assurance that the required level of capability has been met. 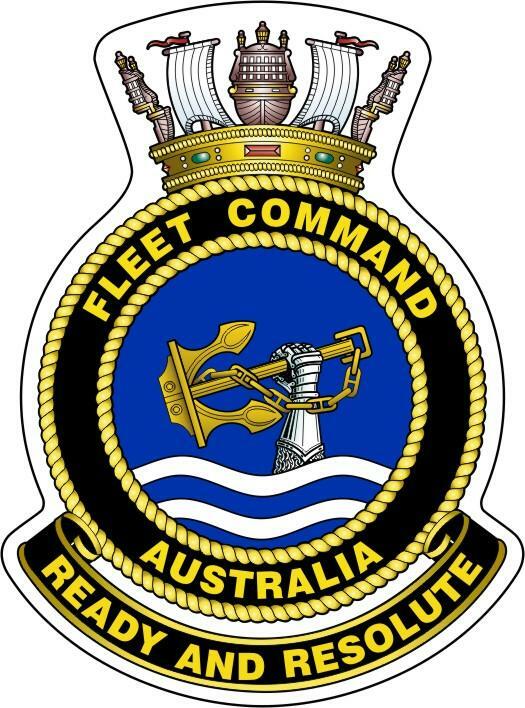 Fleet Command is headquartered at HMAS Kuttabul, Sydney, New South Wales. The Fleet Commander is the primary operations advisor to the Chief of Navy. Additionally Chief of Navy has delegated full command of all of the RAN’s ships, submarines, aircraft squadrons, diving teams and shore establishments to the Fleet Commander, who is responsible for force generation. This includes the group and joint collective training of fleet units and overseeing the maintenance and support of ships, aircraft and other equipment, to enable the fleet to reach and maintain required levels of readiness. The Fleet Commander exercises command of shore establishments through Commander Shore Force (COMSHORE) and delegates operational command of units to the various force commanders. Operational control of fleet units will usually be delegated to the Director General Maritime Operations (DGMAROPS), with tactical command either held by DGMAROPS or delegated to Commodore Warfare (COMWAR), a subordinate tactical warfare commander, a nominated Commander Task Group (CTG) or ship’s commanding officer, depending on circumstances. Providing advice on the raise, train and sustain functions to the Fleet Commander, especially as it relates to preparedness management within the fleet. Exercising operational control/tactical command of force elements once delegated by the force commanders. DGMAROPS has oversight of the Maritime Operations Centre (MOC) located within HQJOC. The MOC coordinates the execution of all maritime activities and operations conducted by fleet units that are not assigned to a designated Joint Task Force (JTF) commander. DGMAROPS exercises operational control of all RAN units at sea and tactical command of ‘routine activities’ that are below the threshold where a JTF is required. DGMAROPS also has responsibility as the Navy Submarine Operating Authority (SUBOPAUTH) and development of the Navy Activity Schedule (NAS) – the executive document that articulates the Navy’s priorities. responsible to CJOPS for maritime joint force headquarters tasks. The fleet battle staff command large multinational naval and amphibious task groups and provide the ADF with this core tactical maritime expertise, which can be adapted to a wide variety of situations. They also provide an overall planning capability for sea control operations with input from amphibious or mine warfare and clearance diving tactical warfare commanders’ staffs. Elements of these staffs will operate afloat or ashore as necessary throughout an operation. This position is responsible for the capability management of the RAN’s destroyers, frigates, amphibious and afloat support vessels. Additionally they are responsible for surface force input to the development of future capabilities. This position is responsible for the capability management of the RAN’s submarine force. Additionally they are responsible for submarine input to the development of future capabilities. This position is responsible for the capability management of naval aviation and the development, oversight and regulation of operational airworthiness standards for RAN aircraft. Additionally they are responsible for naval aviation input to the development of future capabilities. This position is responsible for the capability management of the RAN’s mine warfare, hydrographic and patrol forces. They have responsibility for mine warfare, hydrographic and patrol force input to the development of future capabilities. Additionally the Australian Hydrographic Service (AHS) supports the national charting responsibilities and publishes Australia’s nautical charts and associated publications. This position delivers shore force capability including naval facilities, infrastructure and port services in compliance with seaworthiness requirements. Additionally they provide Navy policy to meet Defence preparedness requirements and management of the relationship with the Defence Estate and Infrastructure Group (DEIG) for matters such as garrison support.